TikTok, or Douyin as it’s known in China, is a social media app by Chinese tech company Bytedance. Much like Vine (RIP), TikTok enables people to record and share short video content, and for periods of 2018 it was the most downloaded app in the App Store. It also claims to have over 800 million daily active users. TikTok is a destination for short-form mobile videos. Our mission is to capture and present the world’s creativity, knowledge, and moments that matter, directly from the mobile phone. TikTok enables everyone to be a creator, and encourages users to share their passion and creative expression through their videos. Essentially, people use TikTok to share fun, meme-related videos. This Twitter thread by Sally Kuchar highlights a few examples of TikTok content. 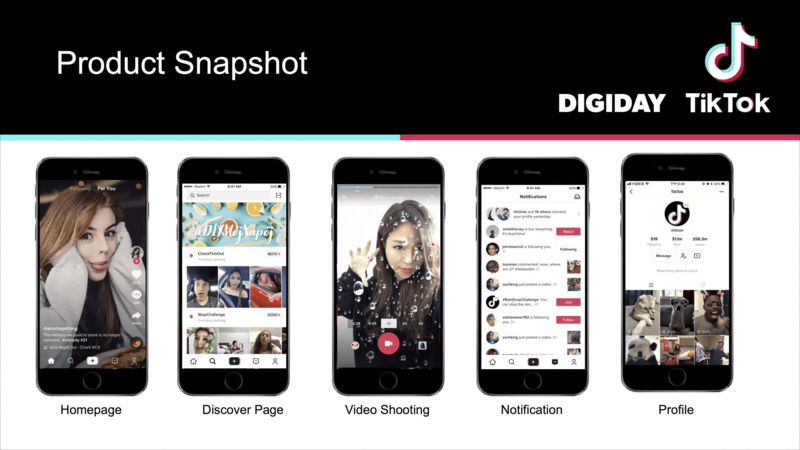 In November 2017, Bytedance acquired a popular social media app called Musical.ly for a reported $1 billion. Musical.ly launched in 2014, and had amassed more than 100 million users across Europe and the Americas. After the acquisition, Bytedance decided to merge Musical.ly with its own app, TikTok. The goal of this was to help TikTok expand its reach across the globe after it had already hit 500 million users in Asia. TikTok’s most important two pages are the homepage and discover page. When you open TikTok, you’re taking straight to the homepage. Here you’ll see the latest trending videos from popular creators. One great thing about TikTok is that you don’t need to follow anyone to get started, you are shown content as soon as you login to the app — though as you begin to follow more people, your homepage will show you content from those creators too. The discover page enables you to search for users and hashtags, as well as showcasing some of the current trending hashtags and challenges. All TikTok users also have a profile page that showcases their videos, as well highlighting their follower numbers and video view count. TikTok videos can be up-to 15-seconds long and users are able to string together clips into 60-second Instagram story-like posts. Most of the Musical.ly’s users are young: 75 percent of Musical.ly’s iPhone user base in February was female, and 50 percent was aged 13 to 24; on Android, those percentages are 70 percent female and 60 percent aged 13 to 24. With growth showing no signs of slowing down, and a highly-engaged user base, it was only a matter of time before businesses started using TikTok for marketing. 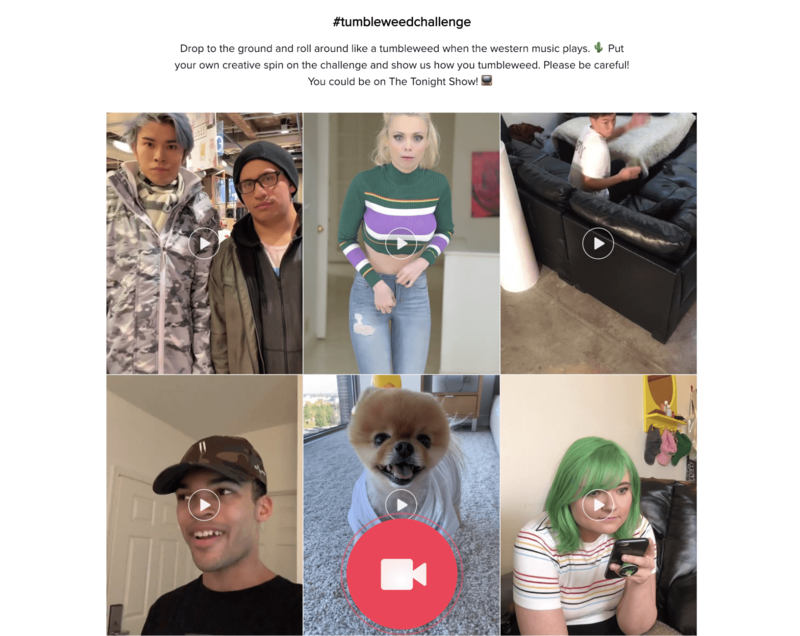 Challenges form a key part of TikTok’s community and content. At any time, there will be a bunch of challenges that users can participate in, and concept of a challenge is quite simple: users take an idea, and iterate upon it in their own videos. For example, Jimmy Fallon launched the #tumbleweedchallenge on TikTok. The challenge encouraged users to drop to the ground and roll around like a tumbleweed when western music played in the background. Now, more than 8,000 #tumbleweedchallenge videos have been shared on TikTok. Also, we were recognized as a top Video Marketing Company on DesignRush. 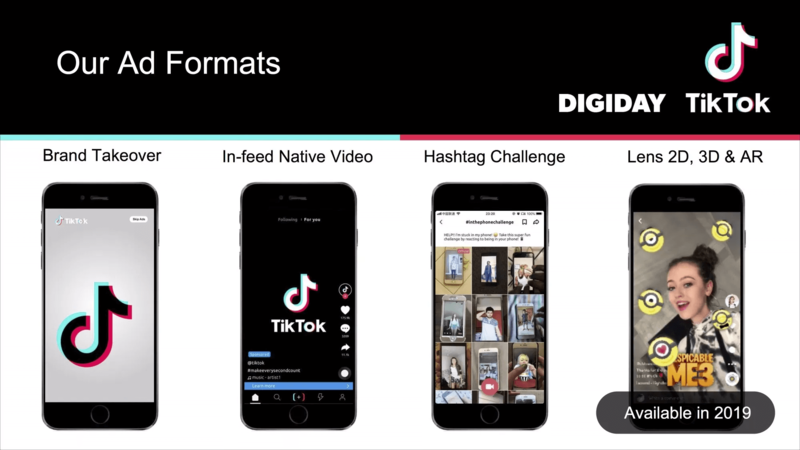 In a deck shared with a European advertising agency, and published by Digiday, TikTok offers hashtag challenges as an advertising format for brands that might want to create branded challenges. 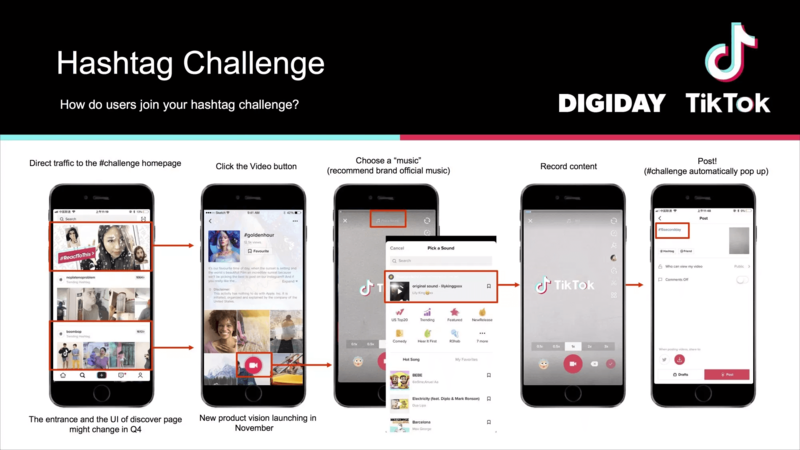 Hashtag challenges are a core part of TikTok’s app, and to be successful, you don’t have to have to pay to promote your challenge — though TikTok’s paid options, and working with influencers, are great ways to encourage more users to get involved. Ads started appearing on late in January 2019. One of the first ad units was spotted by Chris Harihar, partner at Crenshaw Communications. The ad lasted around 5-seconds, Chris noted on Twitter and there was a button in the top right corner of the screen to skip the ad completely. Brand Takeover ads can be still images, GIFs and videos. 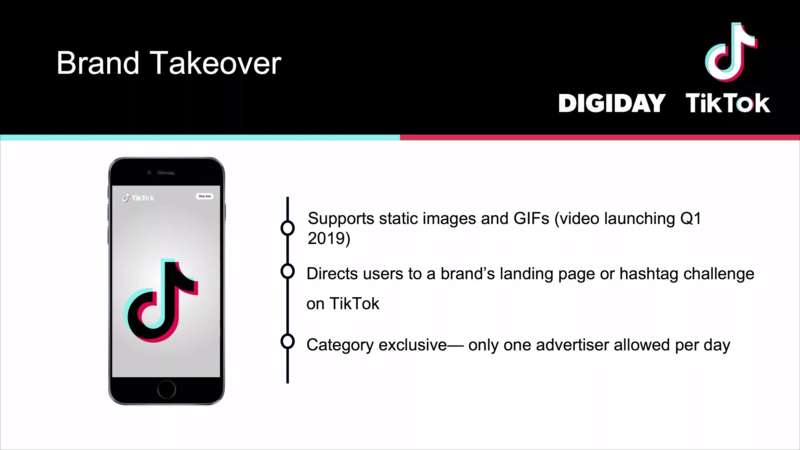 The ad can be linked to a brand’s landing page or a Hashtag Challenge within TikTok, and these takeovers are exclusive to categories each day – so only one brand can takeover a category each day. 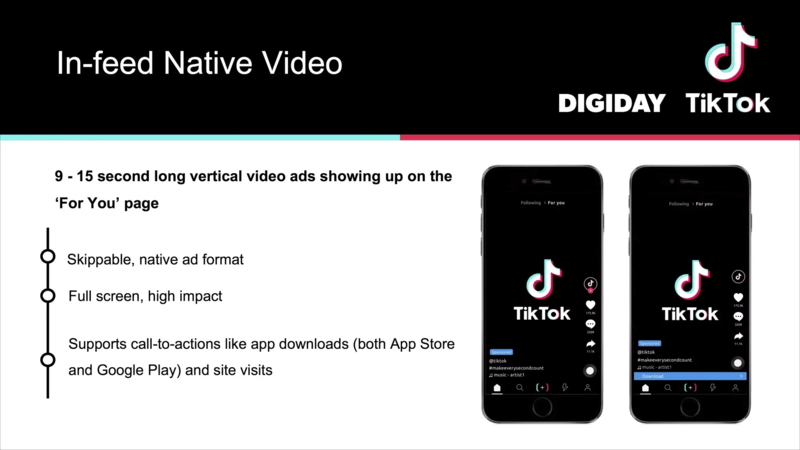 Videos in TikTok last up-to 15-seconds, and In-Feed Native Video ads must be between 9-15 seconds in length. The ads are full-screen (much like Instagram Stories ads) and skippable. This ad-type also supports multiple objectives such as app downloads and website clicks. Brands will also be able to create video campaigns and measure the impact of overall campaigns as well as individual videos. 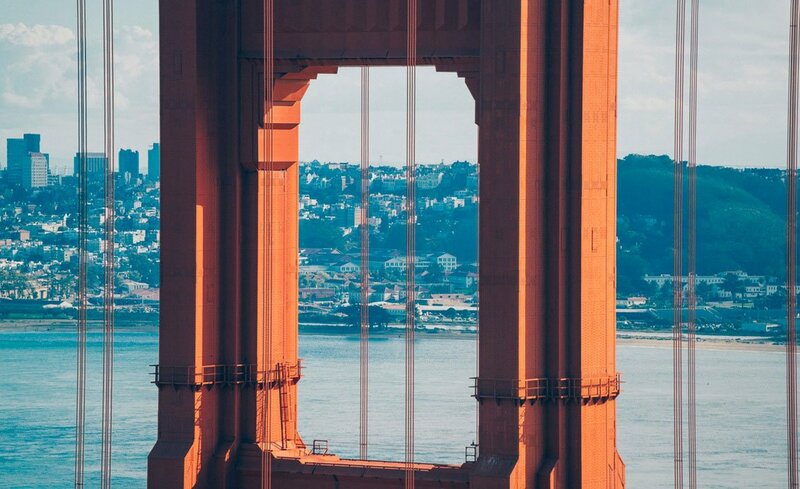 Brands can create sponsored Hashtag Challenges. 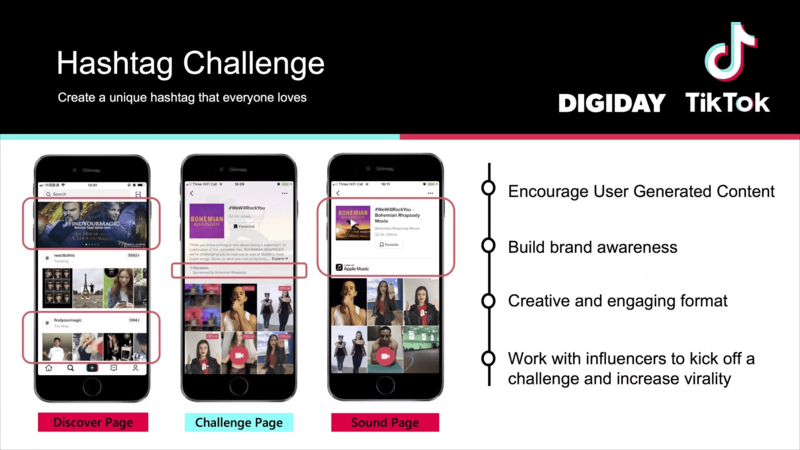 With Hashtag Challenge ads, your challenge will be have a unique banner within the TikTok Discover page that drives users to a challenge page featuring instructions for the challenge and existing content using that hashtag. Fashion brand Guess was the first brand to run a sponsored Hashtag Challenge on TikTok. During the campaign, as each TikTok user opened the app, they were directed to the #InMyDenim challenge. To kickstart the campaign, Guess worked with popular, and influential content creators including @ourfire (2.3M fans), @madison_willow (+983K fans), @jammincammy (+184k fans), and @operamericano (+380k fans). Videos associated with the #InMyDenim challenge have now been viewed more than 36 million times. Branded Lenses are not yet available within TikTok, but will be released in 2019. 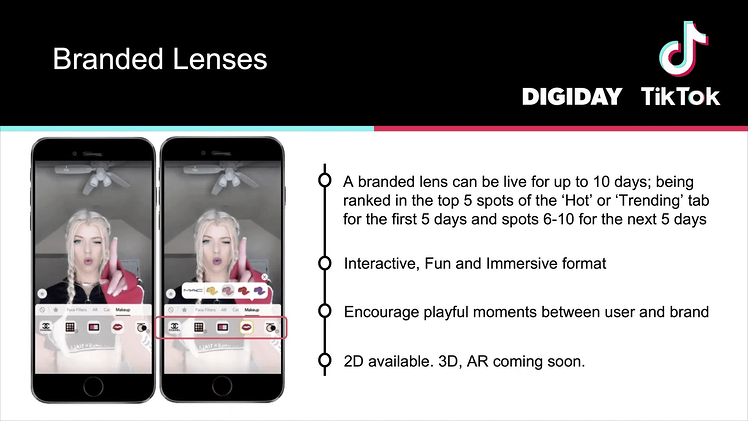 Much like Snapchat and Facebook’s AR lenses, a lens on TikTok will be available for a set amount of up (up-to 10 days) and will be featured in key spots throughout the app. User participation and user-generated content are the most important parts of any TikTok marketing campaign. One brand that understands this is Chinese restaurant Haidilao. Haidilao introduced a “DIY” option to its menu, and when a customer requested this they would be able to create their own unique, off-menu dish. This campaign resulted in Douyin users flocking to Haidilao to film their experiences and share their meals with others on the network. More than 15,000 people requested the DIY option at one of the chain’s restaurants, with more than 2,000 videos shared in TikTok — generating more than 50 million views. Success on TikTok and Douyin is all about finding ways to encourage users to create content around your brand, or participate in branded campaigns — if you can offer something exclusive to TikTok creators, that’s a great way to encourage users to create content. Influencer marketing is huge on platforms like Instagram and YouTube — and guess what, it’s also big on TikTok. We shared earlier how Guess recruited well-known TikTok personalities to promote its #InMyDenim challenge, and that’s not the only example of brands turning to TikTok influencers as a part of a marketing campaign. Adidas has used Douyin to promote its youth-focused brand, Adidas NEO. Adidas Neo set up its Douyin account in January 2018, and in order to grow its presence on the platform it partnered with celebrities and TikTok influencers such as Dili Reba and Yiyang Qianxi. On Douyin, Adidas Neo shares content featuring its products but not in a direct way. Its videos usually show people having fun, and messing around wearing Adidas Neo products, but the content doesn’t focus specifically on the brand. Fung Business Intelligence reports that the Adidas Neo account attracted 1.21 million followers and 2.8 million interactions (including the number of followers, number of “likes” and comments received) in its first month on the platform. I hear you, not every brand has the budget to hire influencers or invest in paid ads. But part of the fun with TikTok is that the content doesn’t need to be super-polished, or high quality to succeed. In fact, it can in some ways, be better if your content is a little scrappy and silly. Originality should always be prioritized over budget on TikTok. If you want to get started, and test the water a little, simply set up an account and start posting fun content to see how the audience reacts. Have you tried TikTok marketing yet? TikTok is an exciting social media platform, and with ads rolling out throughout 2019, there is sure to be plenty of opportunity for marketers to generate ROI from the platform. If you've used TikTok — for marketing or otherwise — I'd love to hear your thoughts.